I interrupt my regularly scheduled program of vintage perfume reviews to share with you the most tantalizing email I've gotten in a while. I woke up this morning with a message from an eBay seller: "misscellanies thought you might like this item on eBay." I click over, and it is a freaking VINTAGE PERFUME VENDING MACHINE. Yes, I would indeed like this item on eBay! A little too much in fact. It dispenses 20s-era perfumes like Arpege and Evening in Paris via "nips" (thin plastene tubes filled with perfume) that you break open to apply. It's crazy to think that perfume was sold the way they now sell Doritos or Reese's Peanut Butter Cups! It's not the first time I've seen a vintage beauty product vending machine, though. A long time ago when I was a kid, my family and I took a road trip and stopped off at an Oklahoma Stucky's (diner, purveyor of tchotkes and gew-gaws). On my way to the bathroom I noticed an odd vending machine that sold lipstick. I put a quarter in, and out came a gold-plated, salmon-colored lipstick that smelled perfumey. This time-machine was just sitting there dispensing 40-year-old lipstick. Well, now I see that memory was not a figment of my imagination. Although I've read about modern perfume vending machines, I've yet to run across one. (This company is hawking the idea and Zoom Systems, the folks that brought you the iPod vending machines, have collaborated with Coty.) I would love to see this catch on! Who couldn't use a little Carnal Flower or Muscs Kublai Khan pickup in the middle of the day? As extravagant as this perfume vending machine is, I sat there for a long time after I clicked over on eBay, eyes wide as saucers, trying to tell myself that $395 to hit the "Buy It Now" button would be money well spent that I would never regret. Alas — it would also be money I don't have! But, I can revel in what an incredibly fun and glamorous relic this is. I'm trying to picture an American woman in the 1930s in her tailored suit getting coffee somewhere and realizing, "Gosh darn it, I forgot to put on perfume!" But no worries, Evening in Paris is right over there for 25 cents! 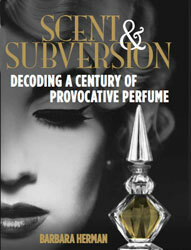 If this catches your fancy, check out my post on the history of vintage perfume nips. Well, your site certainly has a new look!! Thank you so much for putting me up on your new blog roll-- tip o' the hat! And thanks, too, for listing your many fine articles-- I'm a newbie to old scent-- I need to start out slooooowly with stuff I've heard of, before I get to the truly lost-in-the-sands-of-time stuff. Hi! Lucky you. You can find those vials quite regularly on eBay, although if you want them in those unopened tubes, I think they're pricey. What perfumes are in your vending machine? I want one of these for my house! I have no idea why I had not seen your site before but I will be coming back frequently! Are you still selling this perfume vending machine? I have been going crazy looking for one and of course the "nips" to put in it. I can remember my sisters having these when I was very young. I did go on ebay and saw it but it says you do not ship internationally and I am in Canada. So my question is do you still have it and would you concider shipping it to Canada? Hi, Condeet, I am sorry I am not selling this! I would contact the seller, though, and see if she will reconsider shipping it there. I linked to her store on eBay. Good luck! So glad you got a blast from the past, Wild Violets. Finding this reminded me of vintage lipstick vending machines I'd seen in my youth (vending machines that were no longer used and the store just didn't bother to get rid of, mind you). Hi, just found your site while I was trying to find info on a coin operated perfume vending machine called Vend-A-Scent. My husband just bought out a storage bin and one of these was in there. We are currently trying to find a vending machine key to open it and see what it looks like inside. I have googled Vend-A-Scent, and am not coming up with much. I have searched coin operated perfume, scent and fragrace machines, but am finding very little about the Vend-A-Scent. Nothing like it anywhere on ebay, that I can find. Hi Brenda, I'll check around and see what I can find. An eBay seller sent me that auction and that was the first I'd heard of a cosmetics vending machine, outside of the vintage lipstick vending machine I'd seen once as a kid. I'll let you know if I find anything! I am reaching vintage lipstick vending machine and found you. I have 2 of these exact machines but for lipsticks (both still have product)labels with color choice in excelent condition. each end of manchine hold tissue to blot lips. I am selling both and was looking for worth. I thought this is only available in museums. I like the idea of buying a perfume in a dispenser, its unique. And to think that this item is older than my mom this definitely cost some bucks. Thanks for sharing information. Really interesting idea of taking perfume through vending machine. I would definitely try it out. I remember seeing these- my mom (a 1956 HS Grad) had some of these tiny glass "bottlettes" when I was a child. Wow- what a blast from the past! I have a similar Perfume vending machine made in 1939 by A.B.T. Corp in Chicago. It works perfectly and has 4 different selection compartments but no vials of perfume. It also takes quarters. I am looking to sell it. My name is Matthew you can email me at mahammack@yahoo.com as I will be listing it on eBay soon. The first time I ever experienced Chanel 5 was in Apache Jct Az. I was traveling to LA, Ca, and I pulled over to have coffee in a small town in AZ in 1982 very late at night. In the restroom, there was a perfume dispencer. For a quarter you could get a spritz of Chanel 5 or a small selection of other perfumes. Needless to say, I spritzed Chanel 5. That and a cup of the best coffee I ever experienced gave me the strength to travel on to California. This gave a spritz of perfume, not a nib. It said to stand in front of the machine or put your hankie in front of it!! I have what I believe is an antique perfume vending machine. It has no markings except on the bottle inside, which is marked "United States Automatic Perfuming Co. Chicago, Ills. 1890". This is a wall mounted unit, wooden box, with a large cast iron horn or bell (looks like a flower). I have searched this and found only one machine and it is not like the one I have. Can you give me any information on how to research this further? How do I send you pictures? i have one of these perfume 25 cent perfume/napkin holders i am wondering if anyone knows the value of it it has 3 different types of perfume in it. chanel no. 5 , jealousy and arpege. I remember purchasing my first lipstick from a vending machine in the ladies room of the Pix Theatre in Hollywood Cal. That was in 1968. My mom said the color made me look dead.it had a small slit and you used the nub as a lever, no roll-up device. Thanks for the memory! this is great - I was just trying to describe a machine like this (not seeing it above) to my husband yesterday. for some reason the memory came back to me of the machine in the bathroom of the dairy queen that my paternal grandparents had in southern oklahoma in the sixties. I have no idea why the machine was in the bathroom, as it was not a public restroom. I was fascinated by the machine. it took coins, I don't remember what denomination or cost. the perfumes were Evening in Paris and the like. they were dispensed as individual "nips" as I recall, which even then I thought was a weird and dangerous way to sell things. I was a tomboy but the little nips were irresistable. later my grandfather committed suicide in the bathroom. I always wondared what became of the little perfume machine. weird, huh? Do You Wear Perfume for Yourself — or Others? Huffers vs. Scrubbers: What's On Your List? The Princess and the Perfume: Who Is Helietta Caracciolo? What Perfume Are You Going to Wear on New Year's Eve? What Perfume Did Your Mother Wear? What Perfume Would the Women of Mad Men Wear? What Would Your Life Look Like Measured Out in Perfume? What's Your Sign's Signature Scent?